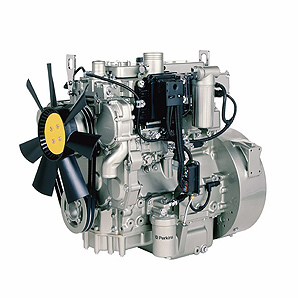 Concentric Pumps Ltd. has designed the oil and water pumps for the Perkins 1100 Series three, four and six cylinder diesel engines designed to meet forthcoming EU and North America Stage 2/Tier 2 off-highway emission legislation. The most innovative of the Concentric designs is the oil pump sub-assembly for the redesigned 4 cylinder 4.4-litre engine. It is essentially an oil-directional manifold system incorporating a complex pattern of galleries incorporating the pressure-relief valve as well as the pump itself. The main structural elements are lightweight, aluminium castings and the whole assembly is built around a ladder frame that bolts on to the underside of the block. In addition to the technical advantages of such an integrated system, the Concentric solution streamlines the design process, supplier base and production for Perkins. The water pump also makes a significant contribution to advanced design of the 1100 Series. It is of extremely compact proportions, again using lightweight components where possible, but keeping within the axial and width constraints dictated by the engine design. The 4 cylinder engine is at the heart of the Perkins 1100 Series, with a choice of naturally aspirated, turbocharged and turbo, air to air charge cooled variants. It also offers the choice of mechanical or full-authority electronically controlled variants for all aspirations. All 1100 Series engines, including the 3 and 6 cylinder models offer significant noise reduction over their predecessors- up to 3 dB on the 4-cylinder engine. Concentric Pumps Limited is a subsidiary of Concentric plc, a major supplier to the world's, truck and construction equipment industries with plants in the UK, USA and India. In addition to oil and water pumps for diesel engines, the group also manufactures, lubrication pumps for transmissions and compressors, fans, impellers and associated equipment.